EMBARC, the European Bronchiectasis Network, is hosting this 1st world conference focusing solely on bronchiectasis. PROGNOSIS – the German Bronchiectasis Registry – is the German partner of EMBARC and recruits all German patients to the EMBARC Registry. PROGNOSIS is supported by the research network BREATH (Biomedical Research in Endstage and Obstructive Lung Disease Hannover), one of the five sites of the German Center for Lung Research (DZL). The main offices of PROGNOSIS and BREATH are both located at Hannover Medical School. 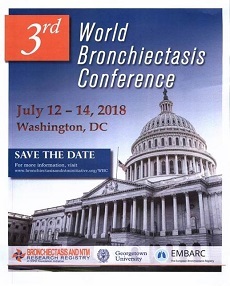 PROGNOSIS and BREATH are the organizers of this 1st World Bronchiectasis Conference, which will become an annual event, taking place in different countries of the partners involved in EMBARC. With all supporting services necessary for the organization and financial execution of the conference BREATH has authorized the agency i!DE Werbeagentur GmbH, http://www.i-de.de.